On Scene: Happy LEAP Day Savings! Bringing you all the best Leap Day Savings, from TheFireStore. For more info, click here. Be sure to use promo code: LEAPTEN at checkout. 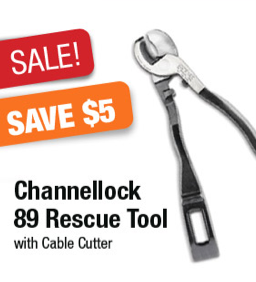 The Channellock 89 Rescue Tool with Cable Cutter, on sale this week! Precision-made by Channellock in the U.S.A.
For more info and to purchase this great tool, click here.